Who is eliminated from Masterchef tonight? 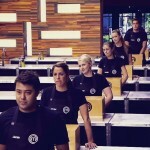 Tonight’s Masterchef Elimination is between the contestants of the losing blue team yesterday. They are John, Rose, Georgia, Sara, Matthew, and Stephen. Ashleigh had the power apron today, she was able to influence tonight by saving a contestant from elimination tonight. She saved Stephen from elimination tonight. The night is divided into two rounds. The first round was a blind tasting challenge. The contestants had to taste and memorise the ingredients in the dish under the cloche. The losers will go into round two and only be able to cook with the ingredients they correctly identify. 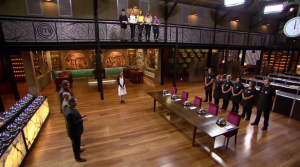 The contestants are blind folded and a bowl of ingredients is unveiled to them. Each food they can identify in the dish they can use to cook with in the next round. John is excited as he realises that it is one of his favourite dishes. The contestants then have two minutes to write down all the ingredients that they could taste in their bowl. John suddenly goes blank and doesn’t know what to write. The dish is revealed as bibimbap, a Korean dish. Sara got 16 dishes correct, the most out of everyone. John got the least, he only got 10 ingredients correct. They now have 60 minutes to use their ingredients to produce a dish for the judges to taste, it doesn’t need to be a Korean dish. Sara is cooking a Kim-chi soup. Rose is going to cook a broth with her beef and mushrooms. Matt is going to cook beef with toasted rice and a salad. John is not quite sure what he wants to make. He decides to make a risotto. Georgie is making beef in sesame seeds with picked vegetables. John has no seasoning ingredients or cheese so he decides to make a mayonnaise and then adds it to his risotto, which he realises that it is a mistake. He realises that he needs to start all over again. This time he decides on a Korean rice ball. Georgia was working on making her vinaigrette when she suddenly sets her frypan on fire. The fire goes out on it’s own. Her vinaigrette is now no good so she decides to make a mayonnaise instead. Time is up and it’s time for the judges to taste the dishes. First up was Georgia’s beef tataki with gochujang aioli and picked vegetables recipe. George said it was “just so yum”, Gary said it was “delicious, just delicious”. Matt said it was brilliant. Next was Rose’s Beef and mushroom broth with vegetables recipe. Her egg wasn’t peeled very well and had chunks missing out of it. George said it was “slightly damaged”, but it was runny inside. Gary said it was “simple and delicious”. George said it was yummy. Matthew’s sesame tataki beef with toasted rice and kimchi salad was next. Gary said it looked a bit dry. George said it tastes better than it looks. Matt said by taking the juice from the kimchi it was very clever. Sara’s kimchi soup with soft boiled egg and vegetable “noodles” recipe was next to be judged. The egg was perfectly runny and it looked really good. George loved how the noodles were done in different shapes. The judges loved it. Finally it was John’s turn to be judged on his korean rice ball with stir fry egg custard and garlic aioli. Matt said the crunchy rice balls were ok, but the mayonnaise didn’t work and the egg custard didn’t go well. George pulled a really bad face when tasting the mayonnaise. If he had of left them off the dish, it would have made the dish much better. Sara, Georgia and Rose were all safe. It came down to John and Matthew. John was eliminated from masterchef tonight. 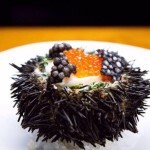 It creates the impression that all professional kitchen follow same way which is disturbing.